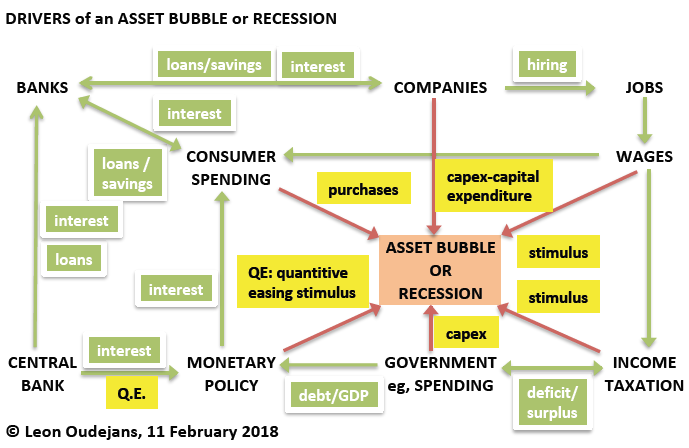 Following yesterday's blog on a new US recession, I created a diagram that visualizes the drivers of an asset bubble and a recession. Actually, these drivers are the same. This makes sense as an asset bubble and a recession are each other's opposite. One involves overspending (asset bubble) and the other one underspending (recession). 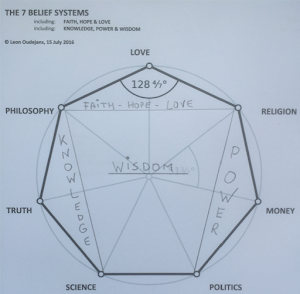 My diagram to the left shows the main actors: consumers, companies, government, and financial institutions (ie, banks, central banks). The flows between the actors are either about spending (eg, products, machinery) or money transactions (eg, deposits, loans, savings, tax). The level of spending can either be stimulated or tightened through monetary policy, like lowering interest rates through quantitative easing. In simplified terms, the total spending by consumers, companies and government on products and services equals Gross Domestic Product - or GDP. The interest rate depends on the money supply by the government's central bank. The government can loosen or tighten money supply through monetary policy, and create a lower or higher interest rate - again in simplified terms. 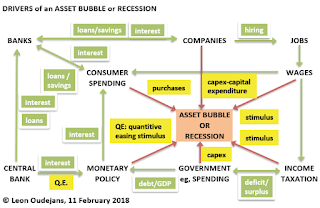 In order to recover from the 2008 recession, central banks in USA (Fed) and then Europe (ECB) started with a stimulus program called quantitative easing (my 2017 blog). This caused a massive increase in money supply and artificially low interest rates. This "cheap money" created sharp price increases in several markets (eg, bonds, real estate, stocks) - a.k.a. asset price inflation. From mid to late 2017, the ECB and Fed announced their intention to unwind their stimulus program of quantitative easing (eg, CNBC, Forbes, FT, Guardian). This made sense given the overheating (read: overspending) on certain markets. Immediately, JP Morgan warned that the "unwinding [of] QE could trigger a financial crisis" (eg, Telegraph). Since the ECB/Fed announcement, long-term interest rates are rising although still low in absolute terms but high in relative (ie, percentage) terms (eg, OECD, USA). Since the Fed chair succession of Janet Yellen by Jerome Powell on Monday 5 February 2018, volatility has hit the stock markets. Real estate prices are still climbing as long-term interest is still artificially low. The start of the unwinding of quantitative easing (QE) may have been too late. It may even never happen to prevent a new recession. QE is like supplying drugs to an addict. Taking away the drugs will result in erratic behaviour (eg, cold turkey). That is what we are witnessing right now.